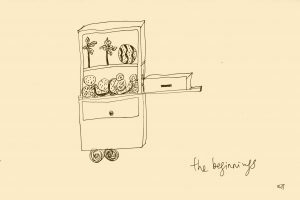 Xi Jie Ng (Salty) from Singapore creates intimate encounters for a noisy world. 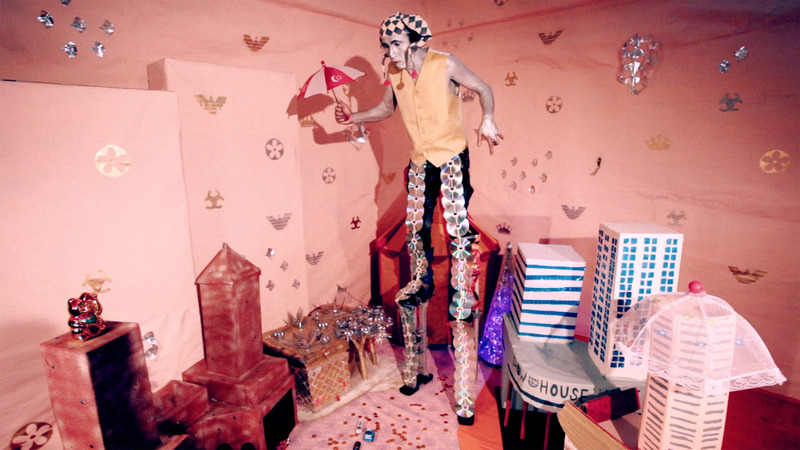 Her works dance between social practice, film, performance (often as Pierrot), installation and writing, and have been made and presented in Singapore, USA, Finland and India. 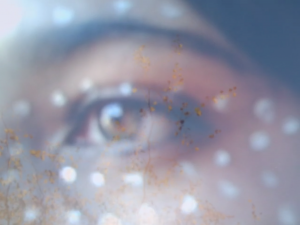 She is interested in art as a universe suspended between fiction and reality, eccentricities, ageing, family histories, circus, old and found objects, alternative communities, and exploring connections between people, space and cosmos. 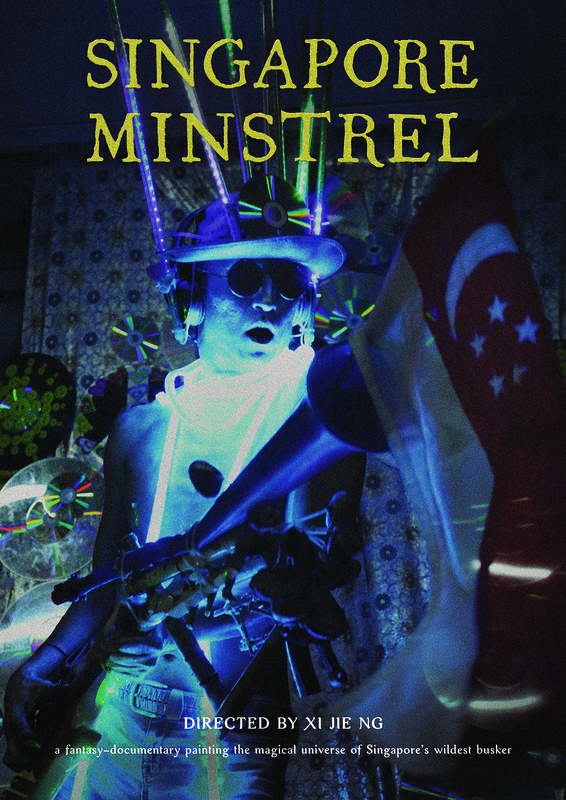 Last year, her first feature film Singapore Minstrel premiered at the 26th Singapore International Film Festival. Based between Singapore, Portland and the elsewheres of the world, she invents experiences for the real and imagined lives of humans. 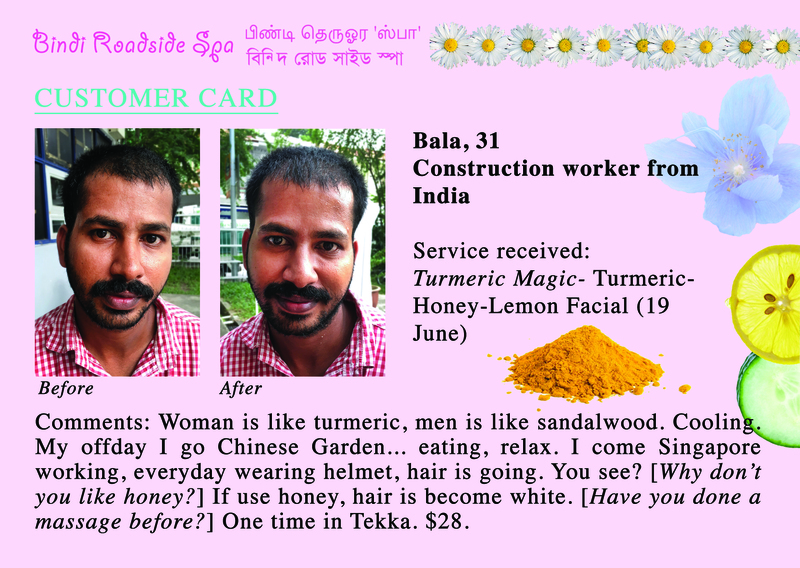 Migrant workers in Singapore shuttle from worksites to cramped living conditions and crowded weekend hangouts. With a limited income, grooming and self-care are largely restricted to necessities. 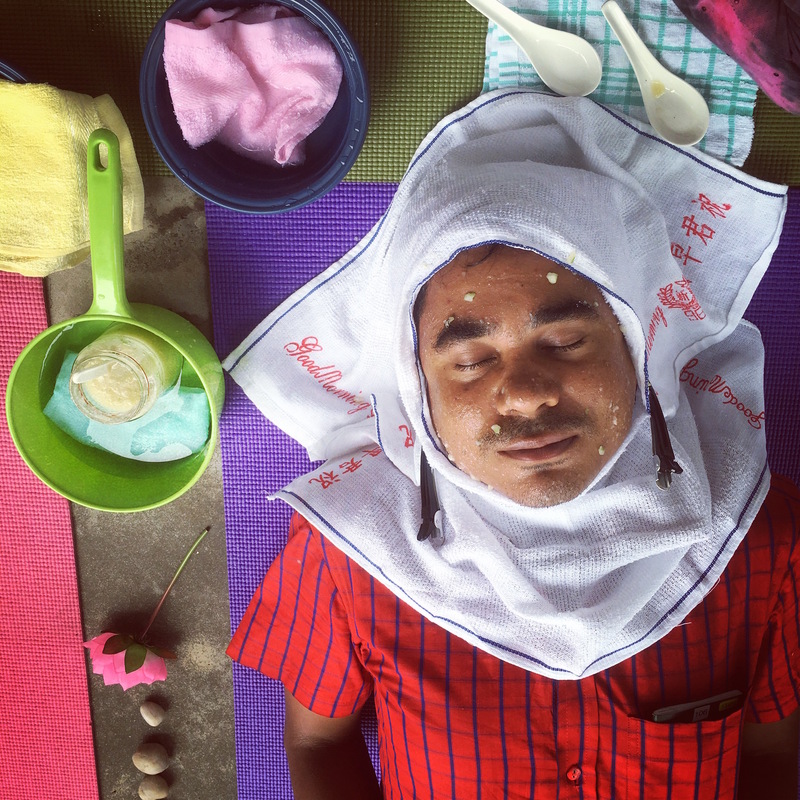 Bindi Roadside Spa, commissioned by Octopus Residency, is an alternative pop-up space of pampering and care for migrants. 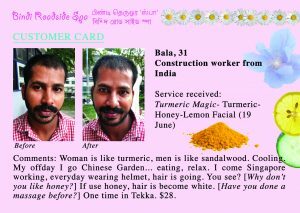 The natural facials are made with foods commonly used by South Asian migrants, featuring turmeric as a star ingredient, or respond to needs such as sun exposure due to work. The Singapore Association of the Visually Handicapped’s mobile massage team was also engaged provide head/neck massages and foot reflexology. By creating conversations around wellness and relaxation, it is hoped that migrants and those around them will place more value on self-care in a relentlessly busy society. Unraveling the nation’s bureaucratic reaches, a discourse on culture and expression plays out, co-starring Roy’s eccentric street colleagues. 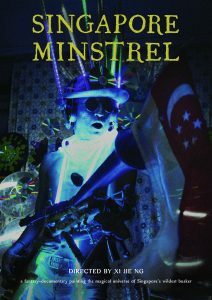 Flowing kaleidoscopically from interviews and fantasy sequences, to Roy’s handphone footage of his everyday life, Singapore Minstrel is an invitation into his beautiful mind, a magical, trying universe where art and life dialogue in a tropical dream. 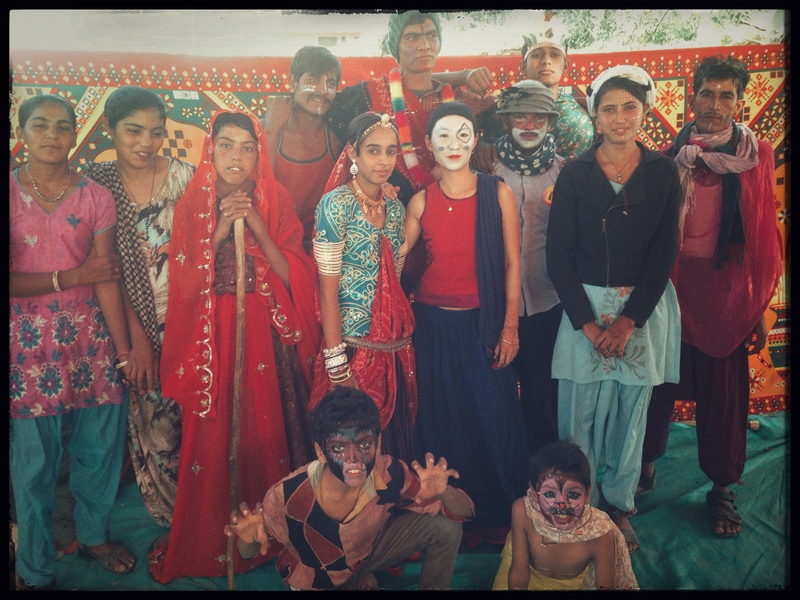 This whimsical and poetic tale of a circus visiting a village was dreamt up with people in rural Jodphur, India at the Sowing Seeds residency. 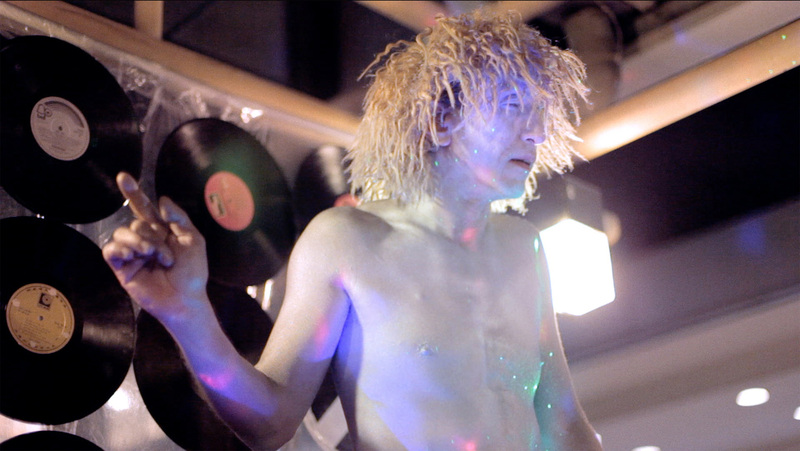 Shot in three days on an old camcorder and using available materials, the film has a raw make-believe aesthetic. With a concept that further developed as relationships grew and ideas sprung up, villagers were cast as characters they created, in an invented world moulded into real, everyday spaces. 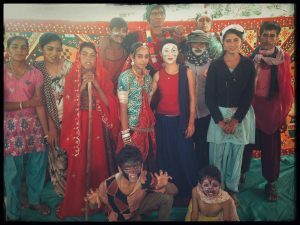 Led by a Clown performed by me, the circus meets Grandma, Manisha, and Tarzan, dancing their way to the moon and back. 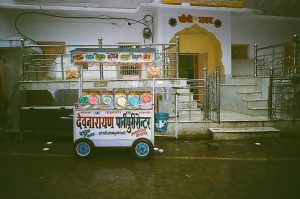 The film shines a soft beam into its collaborators’ cosmic inner selves, reflecting on their ethereal connection with the dry and vast Rajasthani landscape.